Lavalife has been around since 2001 and it takes in members from across the globe. First and foremost it's a matching site for people looking for romance. But if you're after something a bit lighter, you'll find that too. This is a matchmaking website but it's down to you to say exactly what you are looking for. Lavalife caters to relationships that are causal in nature, serious relationships, and those that are intimate and one-time affairs. When you begin your search, you choose which relationship style you want to look for. There's also a 7-day free trial that lets you check everything out before handing over any money. Make use of it! Put as much detail into your profile as possible because that determines the quality of matches. Lavalife started out in North America but it now has members all over the globe. It doesn't always work well for people trying to access the site from other territories. You can use their service on their app as well as their website. Additional portals have been created to address the needs of international visitors, including an Australian site as well as one specifically for French speakers. Creating a profile on Lavalife is free. Creating your own profile is easy and fairly quick. When you fill it out, you are determining what type of relationships you are interested in pursuing. That way other members can search and also find your profile. It's important to put in as much detail into your profile as possible because the matches sent to you will be based on what you write. You'd be surprised how many people complain that their matches are no good when they actually have an empty profile! As I said, I recommend making use of the free trial. Once you become a subscriber, you will have the ability to use more of their features in order to contact members and view other profiles. You have video, email and messaging capabilities through their website. Basic members are limited in how they can contact other members and how many profiles they can view. Other features that members can enjoy include horoscopes, dating articles, advice, and links to other dating sites. 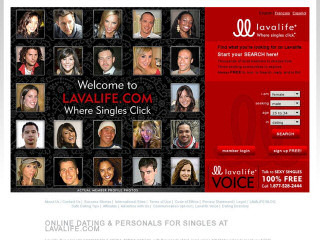 The lavalife is a decent and easy to navigate website - the main drawback I found is the lack of singles to choose from - compared to rivals like eHarmony. Rss Feeds. Subscribe to comments for this site. [?] Receive updates about Lavalife.com directly through your newsreader.